City Savannakhetstill one of the most important cities of the country, it has little offer hotel. Just a couple of hotels, a resort and several hostels, hostels and guest houses are the offer of accommodation offered by Savannakhet. For travelers to Laos who don't know where to sleep in Savannakhet here give you a few clues. The city of Savannakhet is not well prepared for tourism and this is evident especially in the hotels. The quality of the hotels is medium low, the staff barely speaks another language that is not Lao and the services that can be offered to a tourist in Savannakhet are minimal. The good news is that staying in Savannakhet is very cheap. For these reasons in the city of Savannakhet is especially advisable to go it alone and let hoteliers luxuries to other parts of Laos such as Luang Prabang or Vientiane. Different hotels in Savannakhet are found in 2 different areas: Center of the city of Savannakhet or outside. Our recommendation is to stay at a hotel or hostel in the Centre of the city of Savannakhet, and Savannakhet has no buses or taxis are not. It's the Only Resort of Savannakhet and the most luxurious hotel in the city. 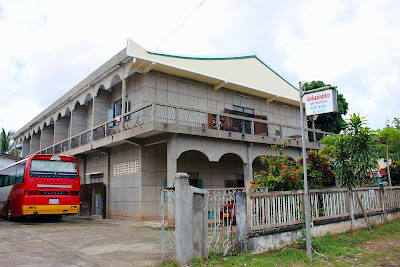 Hotel Daosavanh is located next to the River in the western part of the city, approximately a mile from the center of Savannakhet (Talat Yen square). The hotel Daosavanh is a relatively new hotel, with spacious rooms, a beautiful garden and a swimming pool. The Daosavanh hotel is announced almost all publications written in Laos, in the brochures of Lao Airlines, etc. It is a very colorful and spectacular out, hotel however the interior is a both Spartan and few luxuries, especially the rooms. Buffer breakfast is the best of this hotel, with food mix Western and Asian. This small hotel is located in the heart of the city of Savannakhet, opposite the Mekong River ferry pier and a few meters from the central square Talat Yen from Savannakhet. If you don't want to stay at the Resort Daosavanh, then the New Saen Sabai hotel is the best choice of accommodation. The rooms are functional but not very spacious. Everything inside the hotel are decorated in modern style where straight lines black and white predominate. It is a hotel located in the vicinity of Savannakhet, to market even though you on the outside it looks good, the interior of the hotel Hoong Thip Savannakhet is an dirty and careless. It is preferable to stay in a hostel (for example Leena guesthouse) before staying in the hotel Hoong Thip Savannakhet. It is a hostel or guesthouse than a hostel. It is the cheapest accommodation in Savannakhet option, where for 5€ is available for a double room with bathroom. Leena hostel guesthouse is a small guest house located in the Centre of Savannakhet, with clean rooms and low prices, which become the favorite of backpackers place to this place. During our stay in the city of Savannakhet are other 2 called hostels Savanphathana guesthouse and Souannavong guesthouse. Located on the outskirts of Savannakhet, approximately 8 kilometres from the Centre, is hotel and casino Savan Vegas Hotel & Casino. As well his name indicates it is one casino more than a hotel, normally frequented by Thais and Chinese. It has swimming pool and a free shuttle to Savannakhet, in addition to a game room open 24 hours. Savan Vegas hotel & Casino is a good option for lovers of the game and the stakes, but due to its remoteness, it is not a good choice for travellers wishing to visit the city of Savannakhet.